Although the two plants are from the same family, edamame and field soybeans not only look different, but also serve different purposes. Field soybeans are given time to dry out, turn from green to brown and mature before they’re harvested in late fall. Edamame on the other hand, are harvested much earlier when the beans are young and soft. Field soybeans are grown more commonly in Ohio and are primarily used as grain for animal feed. The livestock industry is the largest consumer of soybean meal, which is the high-protein component left once the oil is extracted, with 97 percent of it used to feed pigs, cattle and poultry. Food-grade soybeans can be made into products such as tofu, salad dressings and cooking oils. 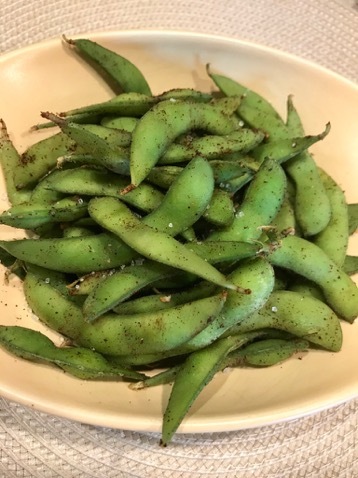 However, edamame is a special soybean variety that has been selected over time for qualities that make them larger and sweeter, which is also what makes them an ideal snack. 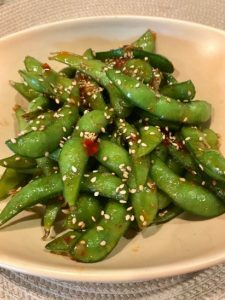 Edamame originated in China around A.D. 100 and became popular in Japan before finally making its way to California in the 1980s. 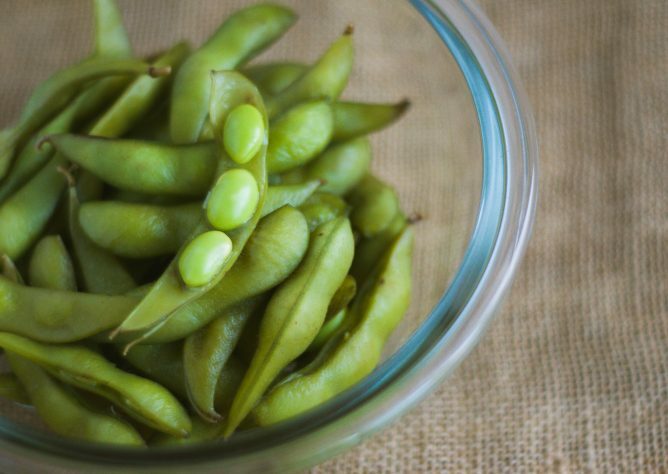 The snack food’s popularity in America has grown over time as consumers become more aware of edamame’s nutritional benefits. Unlike most vegetables, edamame is a complete protein and a good source of nutrients like magnesium, potassium, phosphorous, manganese, fiber, isoflavones, omega-3 fatty acids and vitamins B, C and E.
One of the greatest benefits of edamame is how easy it is to prepare. Below are two recipes with just six ingredients or less! This tasty and healthy bean will have you craving vegetables like you never would have expected. Heat salt, chili powder and red pepper flakes in a skillet on medium heat for 2 to 3 minutes. Once you can smell the dry spices, turn off heat and add the oregano into the dry mixture. Bring salted water to a boil and add the edamame. Cook the edamame for 5 to 8 minutes then drain and use a paper towel to pat the beans dry. Toss the dry spice mixture with the edamame and serve hot. Boil frozen edamame in salted water for 5 to 8 minutes. Drain edamame and set aside. Make sure pot cools down to low heat and add oil. Add garlic and let simmer for 1 minute. Add edamame to the mixture in the pot and finish by sprinkling with salt and sesame seeds.